I couldn’t be more blessed with my parish here in Chicago. There are tons of Orthodox churches all across the city. I know that different students from different OCFs way across the city go to different churches, but I’ve been fortunate enough to find the one in which I feel both comfortable and pushed to be better; welcomed, and supported. Parish life can be something over which we gloss in OCF. Many of our pillars–fellowship, education, service–replicate exactly those that are utilized by the many healthy parishes across the nation. 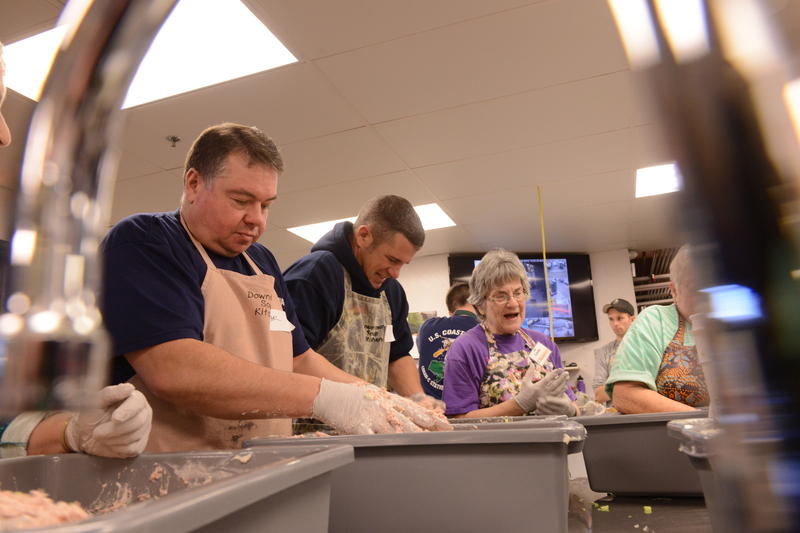 OCF organizes service trips; so do many churches. OCF organizes Scripture study and book readings; so do many churches. 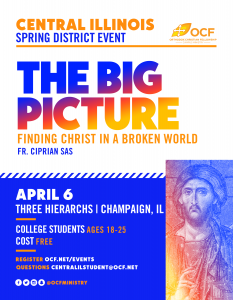 Now, OCF serves these similar functions as the parish for a distinct reason: As a college student, it can be quite tricky to become engaged in these aspects of parish life. Church youth groups are often geared toward younger students, and rightfully so: once those youth leave for college, they can no longer be members of the group. Meanwhile, the adults of the parish–even those on the younger side–have likely been members of the parish for a few years. Their concerns are perhaps starting a family, settling in to their profession, creating a state of permanence that a nomadic college student simply cannot. They’re at a different stage in their life. And accordingly, OCF creates a community of the like-minded, similar-staged college students, that we may be buttressed by these pillars of education and fellowship and service in the Church. U.S. Coast Guard photo by Petty Officer 1st Class Bill Colclough. That being said, we must recognize a crucial point: Both college life, and by extension, OCF life are not meant to replicate the aforementioned permanence of a fledgling adult who has landed in a home, has a home parish, and has some real consistency to their lives. College and OCF life are, by their nature, transient. We forget this because we spend years–long, hard, awful years–in high school being told that the end is college; that we must appropriately cite our sources, because we will have to do that in college; that we must do extracurricular activities, because colleges will like that. Our paradigm for decision-making and effort is solely based on college as an end goal. But it is not an end. It is a means to an end. The end of all things is Christ. The end of all things is the second coming and eternal salvation in the Kingdom of Heaven. As Orthodox Christians, standing in the face of this truth, everything we do must be geared toward arriving at this end as prepared and humble servants; as guests wearing the wedding garments; as virgins with oil in our lamps. As such, my encouragement to you today is to examine: what are your ends? Do you do what you do to get good grades? To get a good job? To make money? To have a family? To live a happy life? Perhaps, even, do you do what you do because it feels good in the moment? I cannot tell you how you should divide your efforts on a daily basis, but I do know that the Lord said, “If your right eye causes you to sin, pluck it out.” If there’s something in your life that isn’t leading you to the kingdom, you have to sit and think about that. It is in this mindset and in this spirit that I return to my original point: I am so blessed with the parish that I have. It is youthful, thriving, and joyous. If I wanted to show anyone what Orthodoxy looks like–not in a monastery on a hill or a village in the home country–but in the center of a city in America, I would take them here. But I don’t participate in that parish nearly as much as I should. Don’t get me wrong: I go to church every week that I’m in Chicago. (Okay, I was really sick like two weeks ago, but you get the point.) But my involvement with OCF–good, valuable, important to me–fools me into believing that I needn’t involve myself with my parish. However, I know that, as the future rolls ever toward me, parish involvement is on my horizon. I know that, to make it to the kingdom, I need a home parish. I need that stability, that consistent involvement, those people who know me well through my faith. I know that my opportunities to serve, to learn, and to commune will no longer come from OCF in the nearing future. And I have to start preparing for that. My prayer is that the Lord helps me do this. It is difficult, to pull oneself far back, to such a wide-reaching perspective–but, it allows the self to make more level-headed, forward-thinking decisions. It is only by looking at the long-term can we gain the insight needed to change the short-term.